Looking for the most reliable way to sync your CRM and email systems? You’ve found it. Riva is trusted by over 1,500 companies, including 50 Fortune 500 companies, 15 of the world’s largest banks, numerous Global 1000 companies and small and medium-size companies. Choose from Riva Cloud or Riva On-Premise, which both give you access to Riva's advanced server-side, transparent CRM to email sync. Looking for the best way to sync your CRM and email systems? You’ve found it. Riva is trusted by 1,200+ companies and over 150,000 CRM users. Choose from Riva Cloud, Riva On-Premise, and Riva for Developers. Think Riva for the most complex CRM and email integration requirements: complex messaging environments, global projects, advanced calendar sync problems, automated email integration, custom enterprise CRMs, and more. Riva connects a dozen leading CRMs to Office 365, Exchange, G Suite and Gmail, IBM Notes and Domino, Micro Focus GroupWise, iOS and Android mobile devices. For advanced CRM integration, all roads lead to Riva. W-Systems can provide you info on CRM solutions that offer the best CRM integration options for your unique needs. Our aim is to make your database and administrative processes as efficient on you as possible. Responsive, helpful, thoughtful. They have been exactly opposite (in as positive of a way as possible) of the typical software sales approach. W-Sytems created my happiness with CRM. 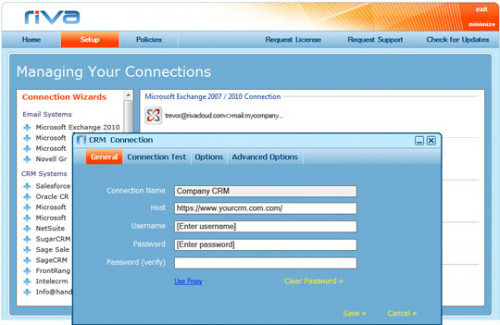 How the Riva CRM Integration can directly sync GoldMine to email systems such as Exchange, Gmail and more. 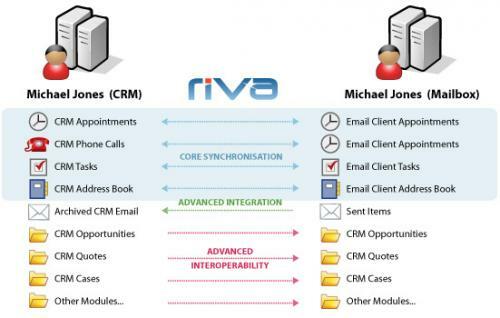 How the Riva CRM Integration can directly sync Sugar to email systems such as Exchange, Gmail and more. How to reliably get current CRM data in, and relevant insights out, within your sales, service, and support processes. Riva Cloud 2018.8 has been officially released. It includes support for Support for SAML authentication and Sync policy configuration enhancements. Riva Cloud 2018.7 has been officially released. It includes support for NetSuite token-based authentication and bug fixes made in previous versions. Riva Cloud 2018.6 has been officially released. It includes support for the NetSuite Application ID.